Through years of perfecting his craft the following specialties. If you are interested in a custom piece of furniture, contact Michael today. The breadth of his work is no better exemplified than here. Michael Sterling has created a wide variety of executive desks over the years, from whimsical to period pieces; classic, bold panel and frame, all the way to very clean and modern. Always using the finest, matched lumber; often from material he has milled himself. Perhaps most noted for his dining tables, Michael Sterling has placed magnificent tables in the homes of collectors from Atlanta to Seattle. These usually include expandability with leaves. With today's larger homes, often a large table is needed for scale. Bookmatched claro walnut boards, figured cherry, or you choose. Any design details are possible, but glance at MS Standard or Filaree tables to see his typical ebony half-round, thumbnail edge treatment, etc. The possibilities are endless. Sterling Woodworking has created hope chests, urns, hat/coat racks, jewelry boxes, showcases, entry tables. All one-of-a-kind museum pieces. 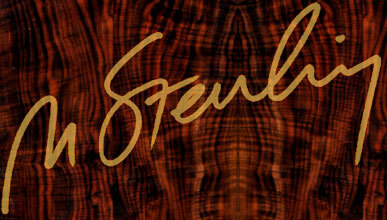 Use rare and exotic rosewood, or domestic figured woods...burl, crotch figure, fiddleback, etc. Add a custom pull or other cabinet jewelry.